One of the most popular figures in the Iron Game today is Reg Park of Leeds, England. this much-traveled physical culture leader has demonstrated his amazing physical development and physical strength in many parts of the world. He possesses huge muscle size, plus good proportion and definition and he is string; in fact he has advanced so far in the latter attributes that he should be considered the top contender for the hypothetical title of The World's Best Developed Man. One finds lots to admire in a man like Reg Park. He seems to have everything a muscle man could hope for: International fame, a flourishing physical culture business, plenty of opportunity to travel, and perhaps most important of all, a happy home life with his wife and daughter. It is easy, however, to understand how he attained this enviable position. You just have to know him for a short time and you will know why. Reg was the feature attraction at our annual "Strength and Health Show" here in Vancouver, B.C. He stayed in Vancouver for three days (visited his aunt and uncle; and was chauffeured around Vancouver by friend Bob Buscombe.) I was impressed at the time, by his proud cultural bearing, and also his intelligence and seriousness of mind. He was very polite to everyone and showed husbandly concern over his charming wife's comforts during their stay. But of all Reg's characteristics, one trait stands out foremost. And this is the one trait that contributes the most to success in muscle-building (or any other undertaking for that matter). What is this all important trait? It's DETERMINATION! They say that nothing can stop a man who has persistent determination to succeed . . . who is willing to do anything or sacrifice anything to attain his goal. 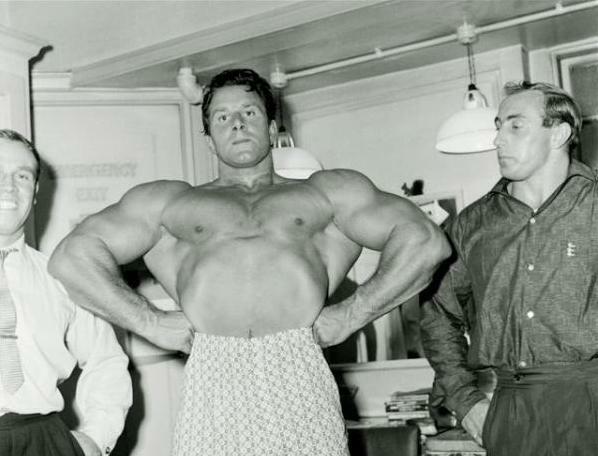 I saw this kind of determination in Doug Hepburn and I saw it again when I watched Reg Park train with the heavy weights. Someone should film a Reg Park workout so that it could be shown to aspiring young bodybuilders. What an education and inspiration it would be for them, watching Reg move from exercise to exercise, stopping only to catch his breath. They would see how he concentrates on what he's doing, how smoothly he performs each movement - no jerking or straining with the weight. They would see how he squeezes out the last rep with the assistance of two spotters. He is indeed an inspiration to watch. These were his measurements on April 29th, 1956, the date of my interview for this article. He stated at the time that he was training for strength and that he was no longer interested in maintaining his body in "physique contest" condition. Reg doesn't have a favorite workout routine. He has done every routine and every exercise in the book. But like most advanced men he has found out what exercises and what routines give him the best results. Advanced training is highly individualistic. What is good for one man isn't necessarily good for somebody else. He says that after the beginner has gone through the preliminary stages of training he will have to discover for himself what exercises are best for his muscle groups. I know a fellow, for example, who gets a good deltoid workout from doing dips on the parallel bars. 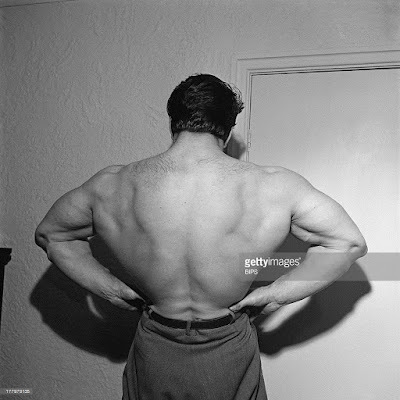 Another fellow, however, who did the same exercise in exactly the same manner received pectoral and tricep development but no appreciable deltoid development. Prior to the Mr. Universe contest of 1951 (which Park won), he worked out three hours every day. Legs on day and upper body the next day. During his stay in Vancouver, Reg did a one hour workout at the Western Sports Gym. He wanted to keep his bodyweight up so he worked primarily on his legs. Watching him then, it was obvious he is a very scientific trainee. Nearly every exercise he did was done a little differently from the prescribed manner. When he was doing the calf raise, for example, he bent his knees. There were other idiosyncrasies in his training. But we all have them so there is no point in listing them here. Nor is there any point in listing the many routines he follows at the present time, since only about 50 or 100 of the readers of this magazine could follow them with any results. In fact, to force the average bodybuilder to follow Reg through one of his typical workouts would be murderous. Nobody, but nobody, works out as fast and furiously for such long periods as Park. Press behind neck, 5-10 sets of 5 reps. Standing Bent Arm Laterals, raise dumbbells from sides to just past shoulder height, very heavy dumbbells for sets of 10 reps. Bench press, 5 sets of 2 reps. That's right: 2 reps.
Squats, 5 sets of 5 reps (of all the exercises he does he likes this one best). Barbell Curl, 5 x 5-8 reps.
Incline DB Curl, 5 x 5-8. French press, standing or lying on the bench. Calf machine, many sets of 25 reps.
Donkey calf raise, many sets of 25 reps.
Leg raises and side bends, high reps up to 100. High Pulls, 5-8 sets of 3 reps.
Power cleans, 5-8 x 3 reps.
Chin behind neck, weighted, 5 x 5-5-8 reps. Note: Reg has never done any specific exercises for his neck, forearms, or since 1951, for his waist. One of his favorite upper body exercises is the Bent Arm Pullover. Reg works each muscle group for approximately 30 minutes. He practices forced breathing between sets. He is more interested in strength than muscle size. He says that the trainee must have the right mental attitude when working out . . . that mental feeling of power and concentration on putting everything you have into your workouts . . . driving yourself hard all the time. Don't fool around, keep talk to a minimum, maybe a joke or a wisecrack to ease the tension. Relax completely between sets and exercises . . . then concentrate on the weight when exercising . . . get mad at it. Have on or two training partners to assist you if possible, to spot you or to help you force out those last two reps.
Reg is very particular about training conditions. He attends to every little detail, likes using Olympic bars because of their springiness, dislikes working out in front of mirrors - covers them up if necessary - wears a complete track suit, and often a lifting belt. Diet? Reg eats like a king . . . but eats only food that is good for him. He eats a prodigious amount of food during the day, but adheres to a very balanced diet, with everything in proper proportion. His favorite food is steak, which he sometimes eats twice a day. He also likes salads, orange juice, and wines (he has a wine cellar in his home). He has used protein supplements and also takes Vitamin Mineral tablets with his meals. Reg has written some courses for beginners and advanced bodybuilders which he says just about cover his ideas on barbell training. I've read them and I think they should be included in every serious bodybuilder's library . . . right along with Rader's, Weider's and Hoffman's courses. 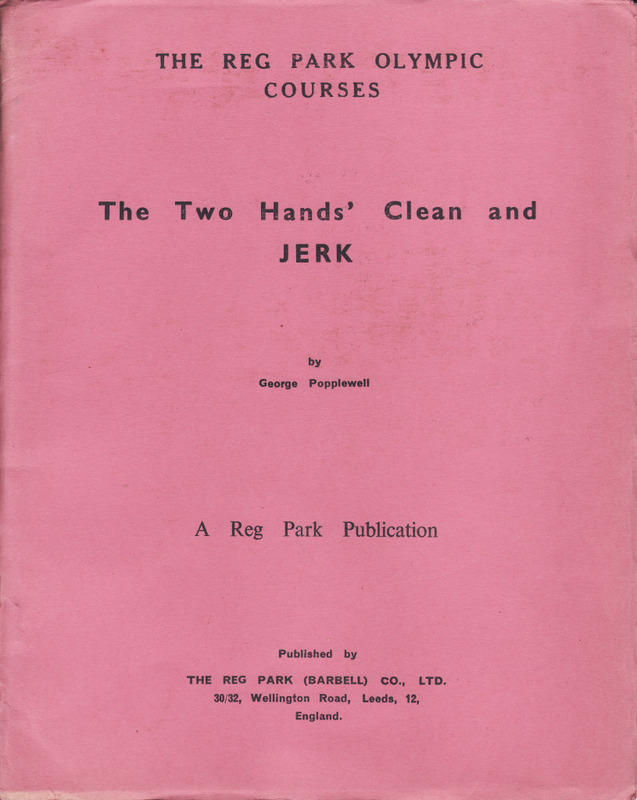 "The Reg Park Olympic Courses" - Enjoy! What about Reg Park's future? Reg says he wants to become the world's strongest man at his bodyweight . . . and perhaps the best built at the same time. And do you want to know something? I think he'll do it! In closing, I would like to mention a belief which Reg mentioned several times. He said that a person shouldn't let training become his only concern. One must hold everything to its right perspective. That is, you should devote a proper amount of time to the social, business and physical sides of living. "Mens sana in corpore sano" . . .